NOTRE DAME, Ind.– In a statement game, the No. 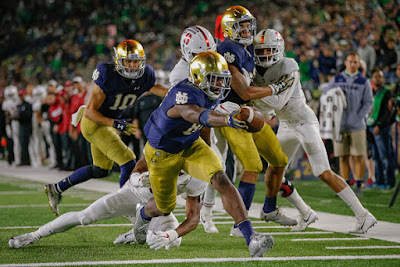 8 Notre Dame Fighting Irish (5-0) once again proved their worth among the elite teams in college football. Notre Dame looked to defend its home turf when the No. 7 Stanford Cardinal (4-1, 2-0 Pac-12) came into South Bend looking to continue their perfect season. The Fighting Irish were able to defend their home turf late and end Stanford’s undefeated season with a 38-17 victory. The two teams traded blows throughout the first half of play before the Irish took a seven-point lead into halftime. With 39 seconds left in the second quarter, Ian Book found Chase Claypool for a ten-yard touchdown. After halftime, Notre Dame never looked back, outscoring Stanford 17-3 in the second half. JJ Arcega-Whiteside proved why he is a top-level NFL prospect on a touchdown reception in the second quarter. Arcega-Whiteside outmuscled the Notre Dame defender to haul in a four-yard touchdown from K.J. Costello. Bryce Love got some huge blocks and scampered through the Notre Dame defense for a 39-yard touchdown run near the end of the first quarter. Other than that run, Love was held to what could be described as a very mediocre game. Outside of the touchdown, Love averaged just 2.12 yards per carry (34 yards on 16 rushes). Dexter Williams made an immediate impact on the Notre Dame offense in his first game back from suspension. On his first touch, Williams blew past the Stanford secondary and found the end zone for a 45-yard touchdown run. Williams finished with 161 yards on the day on 21 carries and the touchdown. The Irish may be without captain Alex Bars, who appeared to suffer a major injury to his left leg in the second half of the contest. Bars is the anchor of the offensive line and missing significant time could be a major blow to the new-found flow of the Notre Dame offense. Ian Book continued to look sharp in his second game as the starting quarterback for the Irish. Book completed 24-of-33 passes for 278 yards and four touchdowns throughout the game. The favorite target was by far Miles Boykin, who finished with 144 yards on 11 receptions and a touchdown. Alize Mack and Nic Weishar also had touchdown receptions in the contest. When asked on the status of who the starting quarterback will be moving forward, coach Kelly was in high spirits. In another great defensive game for the Irish, Julian Love became the all-time leader in Notre Dame history with 33 pass breakups. Love also added two tackles on the evening. The Irish defense was led by Jerry Tillery, who picked up four sacks in the contest on his way to six tackles. Te’von Coney added seven tackles of his own to go along with the lone interception of the evening. Next weekend, Notre Dame will head to Blacksburg, Virginia to take on the Virginia Tech Hokies (3-1). On Saturday, the Hokies defeated the No. 22 Duke Blue Devils, 31-14. Brian Kelly knows that the road ahead will not be easy for the Irish. Stanford returns home to take on conference foe Utah Utes (2-2, 0-2 Pac-12). Utah fell to Washington State, 28-24 on Saturday.